Indigenous activists in Peru are challenging their government and its partners in the biofuels industry--and winning. Photo by Kelly Hearn Women in the native Indian settlement of Andioshiari. For the past two months, Amazon Indians in Peru have put this country in an economic headlock by stringing steel cable across rivers, blocking roads and shutting down oil pipelines. The campaign is aimed at forcing the government to cancel a set of land reforms that loosen restrictions on private development for energy and mining in the Amazonian rainforests. The struggle is ongoing and has led to outbursts of violence, but it’s working. The protests became deadly on June 5 in an oil-rich area called Bagua. For weeks natives had blocked a highway leading to a remote oil facility. When police tried to dislodge them, shots rang out and some fifty police and protesters ended up dead in a melee that left charred, bullet-ridden bodies scattered in the jungle sun. The resulting outcry–and vows by natives to step up their protests–forced Congress to roll back two of the most hotly disputed laws on June 18. But many native groups say they won’t rest until all the noxious laws are gone. Meanwhile, Peru’s pro-business president, Alan García Pérez–who issued the controversial laws last year as part of the free trade pact between the United States and Peru–has watched his popularity plummet as his native opponents have shown bolder resolve. According to a report issued on June 22 by pollster Ipsos Apoyo, García’s approval rating has fallen 9 points to only 21 percent. Ninety-two percent of Peruvians believe the US-friendly leader should have sought native buy-in before passing the laws. And García’s headaches continue to build. To his opponents, Bagua has become a kind of jungle Tiananmen, shorthand for an unprecedented and burgeoning Amazonian insurgency. On June 23, protesters continued marches and road blockades around the central Andean city of Andahuaylas, the Inca citadel city of Cuzco and a mining area called La Oroya in central Peru. The Andahuaylas blockade was lifted after Peru’s prime minister, Yehude Simon, signed an accord promising to open dialogue. Many in the Peruvian Congress (in which García’s party is a minority) are blaming the Bagua massacre on Simon and Interior Minister Mercedes Cabanillas, and calling for them to step down. Simon said on June 17 that he would resign in the coming weeks. On the most obvious level, the native strikes are intended to force the rollback of the land decrees. But they are also more broadly about perceived injustices trickling down from the neoliberal US trade deal. One decree that was revoked, known as “the law of the jungle,” changed Peru’s forest management system in ways that would have given big biofuels companies access to millions of hectares of forestland that’s supposedly compromised (by slash-and-burn agriculture, for example). Natives say the decree violated their right (given by Convention 169 of the International Labor Organization) to be consulted about the law. Having grown used to seeing oil companies do what they please in the jungle, the protesters worried that the law would allow big biofuels companies simply to take whatever land they wanted. While the protesters might not understand the nuances of trade law, they see the big picture. “Tell your leader in the United States to stop buying Peru’s land and water,” one man told me angrily. I’ve heard versions of that statement countless times in the past few weeks–one from Alejandro Ahgulo, a man in the streets of the jungle town Quillabamba, who was standing near a flaming effigy of Alan García made from bed pillows. Taken together, all the decrees in one way or another formalize land ownership deep in the jungle. (One that remains on the books opens the door for hydroelectric dams.) To the neoliberal mind, this makes good sense. But seminomadic, preindustrial Amazon natives in communal settlements don’t have a notion of private property. It’s true that on government maps, native communities “own” land. But on the ground, where government maps matter little, isolated rainforest natives often don’t have formal titles to prove ownership, according to experts like Lelis Rivera, a well-known native supporter who runs the nonprofit Centre for the Development of the Amazonian Indigenous People. On June 11, at 3:30 in the morning, I got into a packed station wagon with Huinchonti, another Machiguenga and Duncan McLean, our documentary director. The driver was a Quechua-speaking Indian who seemed to take personal offense at road rules. By noon, we were in a one-room concrete building in the middle of a steaming swath of jungle in Peru’s southeastern Amazon, near a gritty jungle town called Ivochote, on the Urubamba River. For two hours, we filmed peasants giving seething speeches against the US trade pact, international corporations and, mostly, García. “We can’t let our brothers die alone,” said one woman who wouldn’t give me her name. More than once, a helicopter thumped overhead, luring some outside to squint at the sky and guess at the extent of the military presence overhead. After some bickering, the group decided to carry out a “solidarity action” for those killed in Bagua (eventually it was decided that the protesters would take over an oil pumping station). Everybody was serious. They composed a proclamation and then lined up to sign it. Illiterates used a fingerprint. One of the organizers, Plenio Katigari, reminded everyone that the action would be peaceful. “But make your spears sharp and threatening,” he said. On the drive back to Quillabamba, Plenio called someone on a cellphone. “Get on the radio and call on the communities and tell them we are planning an action,” he said. To avoid being overheard by Spanish-speaking police, he ordered that all radio communication be in the Machiguengas’ ethnic language. Four days later, as the action was getting under way, native leaders in Lima called it off, citing progress in government negotiations. The Bagua movement–if I can venture to call it that–is as much a response to the decrees as to the broader, longer-term campaign to develop the Amazonian slopes of the Peruvian Andes, which are rich with huge deposits of oil and gas. (The Smithsonian Institution has said this is, acre for acre, some of the most biodiverse land on the planet.) To fire its steady economic growth, the Peruvian government–starting with President Alejandro Toledo and continuing with García–has bet the ranch on it. Last August, a Duke University study showed that oil and gas concessions in the Western Amazon had grown to a size as big as Texas. Logging companies are also pulling fortunes from the rainforest. But where governments and companies see profits and royalties, natives–even those who have benefited from jobs and company payouts–talk about contamination and disease, fishing holes ruined by oil barges and hunting grounds emptied by helicopter noises. 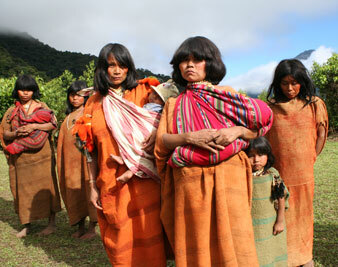 And natives have grown very angry at the way oil companies behave in the Amazon. It is naïve to think that Big Oil is guilty of all the accusations made by natives and their backers. But it’s stunning to see the morally reprehensible actions these companies have taken in the region. Last year, I traveled with a film crew to the Corrientes region in northeastern Peru, where Occidental Petroleum has allegely dumped toxic wastewater into rivers for some thirty years. Now Achuar natives–many of whom have strange illnesses because of toxins in the blood–are suing the California-based company for poisoning their water and blood. We also filmed parts of our documentary in a pitiful jungle oil town called Lago Agrio, in Ecuador’s once oil-flush eastern Amazon. There the world’s largest environmental lawsuit is under way against Chevron, which is accused by 30,000 native Amazonians of poisoning the rainforest with open pits of discarded crude. If the company loses, it could be on the hook for $27 billion. I first realized why natives hate oil companies in 2006, when a source passed me a previously classified “social contract” between a village of Ecuadorian natives and the Italian oil company AGIP, which he’d gotten through a freedom-of-information claim. The native leaders signed the document, which gave the company access to their lands, and waived any right they had to sue. Lacking only beads and mirrors, the multibillion-dollar company in exchange gave the natives, among other things, a soccer ball and an Ecuadorian flag. In more than three years living and reporting in South America, as leftist after leftist has come to power, I’ve interviewed countless people about how their countries are being structured. More often than not, and especially in the wake of the US financial crisis, educated people see free trade as little more than a lie that lines the pockets of the wealthy. They may not be right. But in politics perceptions can count more than truth. If the natives get their way, Peru could follow the statist steps of Venezuela, Bolivia and Ecuador. One thing is certain: the Bagua solidarity movement is making an impact. Most immediately, it has led to the suspension of some of the worst land decrees. But more broadly, it has shown that millions of poor people of color on this continent are fed up with rich white people setting the rules of the game. The corporate powers behind these decrees may get at least part of the Amazonian land they’re looking for, and the Peruvian government, in turn, may fill its tax coffers. That would be good for many Peruvians who want cheap natural gas and affordable electricity. (Who can blame them?) And while natives may claim ancestral rights to lands atop oil and gas reserves, what’s beneath the subsoil belongs to all Peruvians. Despite all the talk about cultural preservation I’ve heard from natives and their rich do-gooder supporters, what most indigenous people seem to want is a share of the profits. And they are increasingly tuned in not only to their rights (as established in the Peruvian constitution and by UN declaration) but also to the fact that jungle activism can get them plenty of attention. Sitting at a negotiating table is one thing; shutting down an oil pipeline is another. Whereas natives once cowered before developers, many are now standing up. And that may be the best way to correct these entrenched power imbalances.